Bifold doors -v- sliding doors – which to choose? When choosing whether to have a sliding patio door or a bifold door, there are a number of factors that you may wish to consider. If you had asked this question a few years ago it would have been a done deal. The bifold door would have won hands down every time. Bifold doors literally exploded onto the market a few years ago and saw a huge surge in popularity. But the latest sliding doors are a far cry from the patio doors of old, offering much wider, contemporary profiles, so the question is, which door do you go for – bifold or patio? The main advantage of bifold doors is that they allow for whole walls of glass to be opened up completely. However, they can be quite frame-heavy, meaning less glazing, and the stacked door panels when open may provide an obstacle to the more modest-sized patio or kitchen. Sliding patio doors provide lots of light thanks to narrow frames and wider expanses of glass. Having no door sections to fold back, they save on space and provide visually “cleaner” lines. 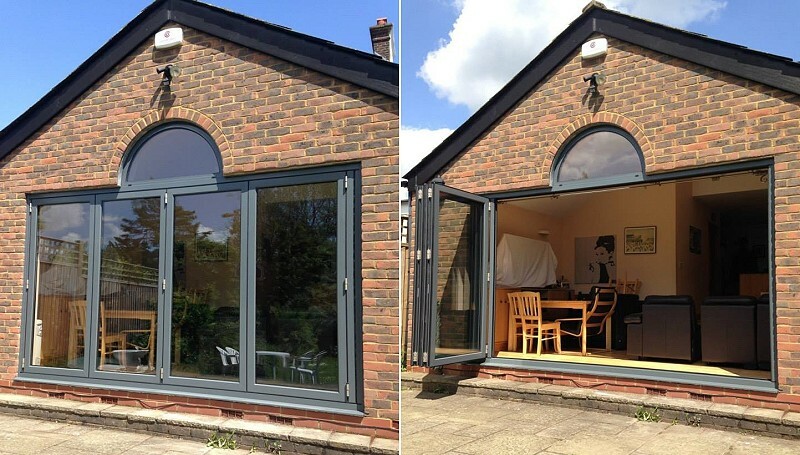 Hazelmere, Surrey: 3-panel sliding patio door in anthracite aluminium. 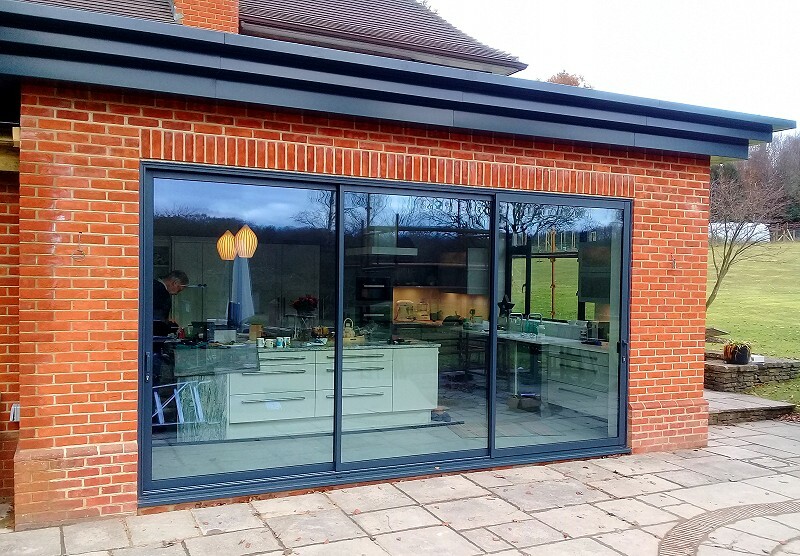 Tring, Herts: 4-panel bifold door in anthracite aluminium with demi-lune toplight. Bifold doors can open up about 90% of the aperture, really opening up the room to the garden. Sliding doors by comparison will typically open up between 50% and 65% of the aperture. For ventilation purposes, the sliding door offers the most flexible solution with the ability to open the door just as far as necessary to make the room comfortable. The bifold door’s flexibility will depend on its design, but often opening a door leaf is the minimum you can do to let some fresh air in. If having an uninterrupted view is important, then a sliding door may be a better option. Sliding doors allow larger panel sizes in wider widths, giving a maximised expanse of glazing when closed. The bigger door panels with large panes of glass give more of a panoramic view than a bifold door that has several narrower door panels, each with a frame around them. With the bifold door, you can choose to have all the door panels stacking to the left or the right, or you can choose to split them so some stack each side. When making these decisions, it is worth remembering that the doors require some clear space around them in order to open, and you don’t want to be moving furniture or plant pots every time you open the doors. The number of door panels will usually be dictated by the size of the opening, but it is worth considering the benefits of choosing a design with a single access “traffic” door. Found on designs with an odd number of door panels, the traffic door is a single door that can be opened without unlocking the rest of the door panels. Operating just like a normal back door, this is convenient for when you just want to nip out into the garden quickly. Still not sure which to go for? Contact us and we can email you our bifold and patio brochures. Check out our brochures page on our website or why not give us a call and have a chat with us about what you want and what you’d like to achieve.